After years of living in Los Angeles, I’ve fallen in love with the city, yet much change is still needed. Despite many successes, Los Angeles continues to be affected by issues that include high unemployment rates, low college matriculation rates, and environmental conditions, all of which threaten public health and LA’s livability. What makes our city unique, however, is that it allows emerging ideas to manifest into world-changing solutions by fostering a culture of entrepreneurship and collaboration. As president of the Goldhirsh Foundation, I am deeply committed to the prosperity and future of Los Angeles. At the Goldhirsh Foundation, we have pioneered LA2050, an initiative driving and tracking progress toward a shared vision of our region. LA2050 poses an important question to all Angelenos: How can we leverage LA’s rich diversity of resources to ignite the passion and creativity of Angelenos and build the city of our dreams? LA2050 and the Goldhirsh Foundation aim to connect the dots between the best emerging innovations and the civic, seed, and expansion capital to help them thrive. We are enticed by the nexus of different industries and sectors to develop solutions to our city’s challenges; challenges that we share with our global community. We are inspired by the emergence of new economies, ideas, and startups that scale impact in a way that is uniquely Los Angeles. Without a doubt, the startup economy is playing a pivotal role in shaping Los Angeles’ future by reimagining markets and disrupting the traditional methods we use to communicate with one another. We are approaching a transformational era for Los Angeles, one in which organizations, entrepreneurs, and policy makers can spur innovative ideas and revitalize economies. The rapid growth of the sharing economy is altering, not only the way citizens perceive each other, but how we approach and respond to problems that may arise now and in the future. Take Airbnb for example, which launched an innovative disaster-response tool after a woman used the app to help displaced families find shelter after Superstorm Sandy. Startups are developing platforms that allow people to maximize their personal assets to produce both profit and social good. They are creating an unprecedented culture shift in cities across the world by developing new modes of communication that allow citizens to fully realize their potential to serve others. The emergence of the sharing economy extends beyond new technology. 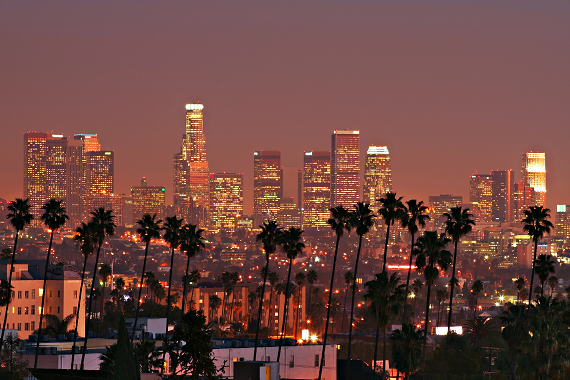 It is deeply rooted in LA’s culture. Los Angeles is rich with learning opportunities, with some of the best Universities in the nation and one of the largest publicly funded library systems in the world. I frequently refer to libraries as a, "Metaphor for the original sharing economy," since they were built as a shared space and are now at the focal point where old and new technology merge to connect the public with digital-age learning opportunities. LA2050 Grants Challenge winners Green Dot Public Schools and No Right Brain Left Behind reimagined the library at Locke High School and transformed it into a space that inspires collaborative learning and energizes student creativity. Startups are producing ideas and breakthroughs that remind citizens of our collective responsibility to ensure that public services and shared spaces such as libraries and schools receive the attention they deserve. In an era that puts a high value on individualism and ownership, startups are helping inspire new ideas and visionary leaders that push us to think more creatively and collaboratively about how we innovate public services and existing infrastructure. What if I told you that a determined grassroots organization with an inventive plan to develop sustainable, affordable housing could be considered a startup? Part of LA’s success in the startup industry stems from our ability to diversify and redefine what startups are capable of accomplishing. This definition challenges the stereotype that all startups consist of young entrepreneurs, colorful offices, and ideas that focus primarily on new technology. T.R.U.S.T South LA drafted an ambitious, imaginative plan to promote neighborhood revitalization by repurposing vacant lots into affordable housing options for Angelenos. By building out a vision for LA’s unused land, T.R.U.S.T South LA also identified existing policy gaps and barriers that prevent our city from developing affordable homes and is actively working with policymakers to change them. Startups are now playing a critical role in a synergetic ecosystem of change-makers and thinkers across a diverse range of disciplines. Startups like Code for America are encouraging transparency and transforming local governments by simplifying bureaucratic processes and increasing access to open data. Today, governments across the world are noticing how technology can be used to build efficiency and transparency and are making an effort to re-evaluate their current systems. In partnership with Code for America and the Mayor’s Office for the City of LA, the Goldhirsh Foundation supported a fellowship designed to deploy technology to promote civic innovation and job creation in Los Angeles. Startups, foundations, and government officials are partnering to leverage the skills and resources needed to reimagine a government that is accessible and easy to navigate. In addition to Peter Marx’s appointment as LA’s Chief Technology Officer, Mayor Eric Garcetti also appointed the Co-Executive Director of Code for America, Abhi Nemani, to serve as LA’s first Chief Data Officer. Startups are training proactive leaders that possess the authentic passion and skills necessary to transform the way citizens interact with government. By collaborating across sectors, we are all part of an ecosystem that is influencing local governments to be more transparent in order to empower its citizens to take an active role in shaping their community. We are all part of Los Angeles’ story. We at the Goldhirsh Foundation did not see a roadmap for Los Angeles’ future, so we thought, “Why not make one?” Through LA2050, we came up with a set of community-led goals to make Los Angeles the best place to learn, play, create, connect, and live by the year 2050. We believe that in order to track and drive progress towards these goals, Angelenos must first be united by a shared vision of success for our region. Startups have developed a spirit of social entrepreneurship that is uniquely Los Angeles by producing a heightened awareness of the challenges facing our city. We want every community member to help us tell the LA story anew, and it all starts with your ideas. To build the LA2050 of our dreams, we need all Angelenos to drive the advocacy agenda and set the priorities. We collectively hold the compass, and the future of LA is in our hands. Tara Roth is the President of the Goldhirsh Foundation. Tara Roth is the President of the Goldhirsh Foundation, a supporter of social, financial and human capital in Los Angeles. Her expertise is in bridging the worlds of business, media, nonprofits, government, and philanthropy to catalyze impact.